Jabulani meaning ‘Happiness’ in Zulu are COFTA approved, the Africa fair trade organization, by providing employment for up to 120 home workers in the HIV/AIDS ravaged Zulu region of South Africa. 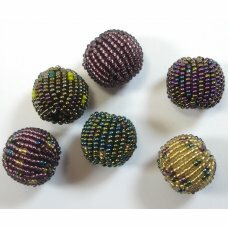 The handmade glass beaded beads offer an inspiration to the jewellery maker, equally perfect used as a set or individually as a focal bead in earrings, bracelets and necklaces. 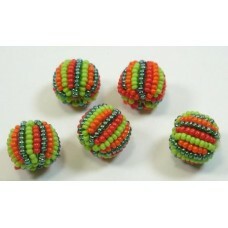 Each inspired and exciting 'colourway' comprises a variety of plain, spotted and striped beads. 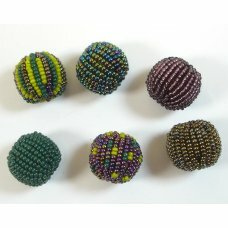 "Your creativity starts with a fair trade artist in South Africa who produces a miniature work of art." 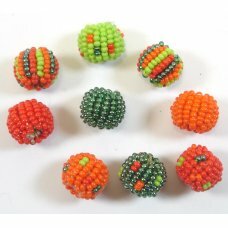 Note the size of the round beads refers to the core around which the tiny seed beads are added, so the finished size is approx 4mm larger than stated in the descriptions. ie 10mm is approx 14mm finished, 12mm is approx 16mm finished and 16mm is approx 20mm finished. 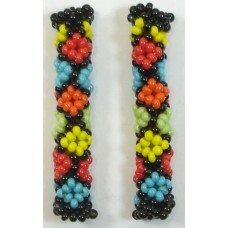 1 Fairtrade Classique Beaded Tube - Spiral - great for earrings - measure approx. 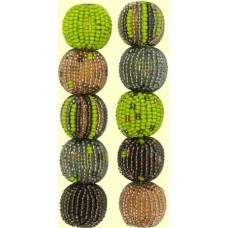 42x6mm (please not..
9 Fairtrade Jabulani Natural 12mm Beads. Oddments to clear, 1 pack only as pictured. 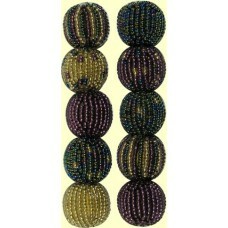 Note size refer..
6 Fairtrade Jabulani Shimmer 16mm Beads. Oddments to clear, 1 pack only as pictured. 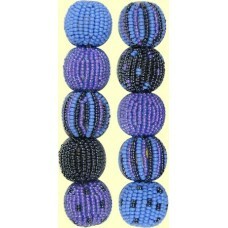 Note size refer..
5 Jabulani Carribean 12mm Striped Beads. (beads actually measure approx 16mm) All identical as pi..
1 Fairtrade Jabulani African Bush Beaded Tube - Diamond Motif - great for earrings - measure ap..
1 Fairtrade Jabulani Liquorice Allsorts Beaded Tube - Diamond Motif - great for earrings - measure a..
4 Fairtrade Botanical Spots and Stripes 16mm Beaded Beads - Random selection of spotted and striped ..
10 Fairtrade Sand & Sky Mixed Pack 10mm Beaded Beads - random selection of spotted plain and str..
1 Fairtrade Magenta Beaded Tube - Band Motif - great for earrings - measure approx. 42x6mm (please n..
4 Fairtrade Shimmer Spots and Stripes 16mm Beaded Beads - Random selection of spotted and striped be..
1 Fairtrade Caribbean Beaded Tube - Diamond Motif - great for earrings - measure approx. 42x6mm (ple..
10 Fairtrade Botanical Mixed Pack 10mm Beaded Beads - random selection of spotted plain and striped ..
10 Fairtrade Pure Passion Mixed Pack 12mm Beaded Beads - random selection of spotted plain and strip..
1 Fairtrade Shimmer Beaded Tube - Diamond Motif - great for earrings - measure approx. 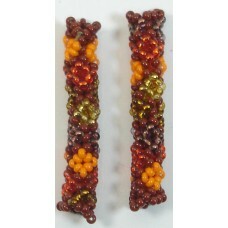 42x6mm (pleas..
10 Fairtrade Shimmer Mixed Pack 10mm Beaded Beads - random selection of spotted plain and striped be..
1 Fairtrade Sunset Beaded Tube - Chevron - great for earrings - measure approx. 42x6mm (please note ..
10 Fairtrade Cornflower Mixed Pack 12mm Beaded Beads - random selection of spotted plain and striped..
4 Fairtrade Magenta Spots and Stripes 16mm Beaded Beads - Random selection of spotted and striped be..
1 Fairtrade Botanical Beaded Tube - Spiral Motif - great for earrings - measure approx. 42x6mm (plea..
4 Fairtrade Raspberry Spots and Stripes 16mm Beaded Beads - Random selection of spotted and striped ..
1 Fairtrade Sand & Sky Beaded Tube - Diamond Motif - great for earrings - measure approx. 42x6mm..
10 Fairtrade Magenta Mixed Pack 10mm Beaded Beads - random selection of spotted plain and striped be..
1 Fairtrade Raspberry Beaded Tube - Band Motif - great for earrings - measure approx. 42x6mm (please..
10 Fairtrade Raspberry Mixed Pack 10mm Beaded Beads - random selection of spotted plain and striped ..
1 Fairtrade Pure Passion Beaded Tube - Spiral - great for earrings - measure approx. 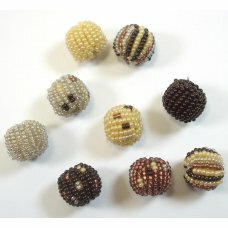 42x6mm (please ..
10 Fairtrade Hot Chocolate Mixed Pack 12mm Beaded Beads - random selection of spotted plain and stri..
1 Fairtrade Golden Earth Beaded Tube - Diamond Motif - great for earrings - measure approx. 42x6mm (..
10 Fairtrade Metallic Blue Silver Mixed Pack 12mm Beaded Beads - random selection of spotted plain a..
1 Fairtrade Forest Fern Beaded Tube - Diamond Motif - great for earrings - measure approx. 42x6mm (p..
4 Fairtrade Natural Spots and Stripes 16mm Beaded Beads - Random selection of spotted and striped be..
4 Fairtrade Caribbean Spots and Stripes 16mm Beaded Beads - Random selection of spotted and striped ..
1 Fairtrade Serenity Beaded Tube - Diamond Motif - great for earrings - measure approx. 42x6mm (plea..
10 Fairtrade Golden Earth Mixed Pack 12mm Beaded Beads - random selection of spotted plain and strip..
4 Fairtrade Sea Breeze Spots and Stripes 16mm Beaded Beads - Random selection of spotted and striped..
10 Fairtrade Natural Mixed Pack 10mm Beaded Beads - random selection of spotted plain and striped be..
10 Fairtrade Caribbean Mixed Pack 10mm Beaded Beads - random selection of spotted plain and striped ..
1 Fairtrade Sea Breeze Beaded Tube - Diamond Motif - great for earrings - measure approx. 42x6mm (pl..
4 Fairtrade Forest Fern Spots and Stripes 16mm Beaded Beads - Random selection of spotted and stripe..
10 Fairtrade Sea Breeze Mixed Pack 10mm Beaded Beads - random selection of spotted plain and striped..
10 Fairtrade Liquorice Allsorts Mixed Pack 12mm Beaded Beads - random selection of spotted plain and..
4 Fairtrade Sunset Spots and Stripes 16mm Beaded Beads - Random selection of spotted and striped bea..
1 Fairtrade Watermelon Beaded Tube - Diamond Motif - great for earrings - measure approx. 42x6mm (pl..
10 Fairtrade Forest Fern Mixed Pack 10mm Beaded Beads - random selection of spotted plain and stripe..
10 Fairtrade Sand & Sky Mixed Pack 12mm Beaded Beads - random selection of spotted plain and str..
4 Fairtrade Sherbet Spots and Stripes 16mm Beaded Beads - Random selection of spotted and striped be..
10 Fairtrade Sunset Mixed Pack 10mm Beaded Beads - random selection of spotted plain and striped bea..
1 Fairtrade Caribbean Beaded Tube - Chevron - great for earrings - measure approx. 42x6mm (please no..